Scientists can already see damage in the eyes of children who have been drinking fizzy drinks and eating too many carbohydrates. In a world-first study, researchers from Westmead Millennium Institute for Medical Research, the University of Sydney, have found that 12-year-olds who drink one or more fizzy drinks or cordial a day had narrower arteries in the back of their eyes. This increases their chances of heart disease and high blood pressure in later life. By examining the back of the eyes researchers can see the health of a person's blood vessel system. The study looked at around two thousand 12-year-old children in 21 high schools in Sydney, and is an extension of a study that last year found similar damage to children who watch too much television. The damage does not affect their vision. 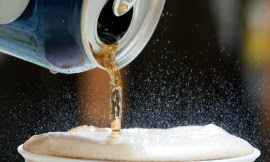 "Children with a high consumption of soft drinks and carbohydrates had a more adverse microvascular profile compared to those who did not drink so many soft drinks or eat so many carbs," said Dr Bamini Gopinath, lead author and senior research fellow at the Centre for Vision Research at Westmead Millennium Institute. "We measured their total carbohydrate intake over the whole day from things like bread, rice and pasta." Retinal microvascular diameter is a potential marker for future cardiovascular disease and high blood pressure in adults, but this is the first study to show that the effect of carbohydrates and fizzy drinks in childhood is linked to a narrowing of the vessels in the retina. Dr Gopinath said she would be very interested to see whether the damage persisted, once data from the follow-up study on the same children at age 17 was analysed.